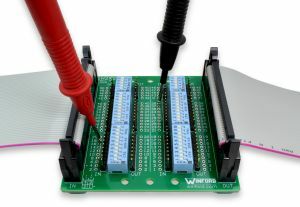 Insert this diagnostic Breakout Test Board into existing cable connections and get access to signals via test points and headers; this is the pass-through function of this board. In addition, switches allow individual signals to be disconnected from the circuit, which aids in diagnostics, troubleshooting, fault tolerance testing, or re-routing specific signals within a cable. This compact design is meant to be inserted into the cabling of a system during operation. Normal system operation can continue while signals are probed and manipulated. It is a handy test point breakout board with inline interruptor switches. 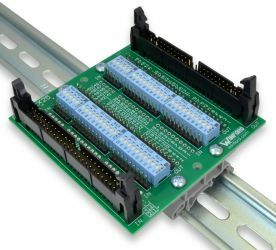 This board contains dual male 2x25 0.1" pitch (2.54mm) IDC50 headers. A breakout test board may also be referred to as a "measurement breakout", "pass-through board", "test breakout", "inline test adapter", or "breakout testing board". Approximate dimensions: 3.5" x 3.6"